Nissans three upcoming sports cars. Nissan is working on three new sports cars to debut in the next few years. The big one being the Nissan GT-R. The premier halo car . The 350 Z will be out soon , and expect to see it with the VQ37VHR - the 370Z ? 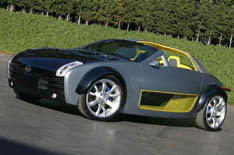 The last of the three cars is a small rear wheel drive car based on the Urge concept from the Detroit Auto Show in 2006. Autoblog says they want it RWD and Sentra SE-R QR25DE . I think it could go either way.